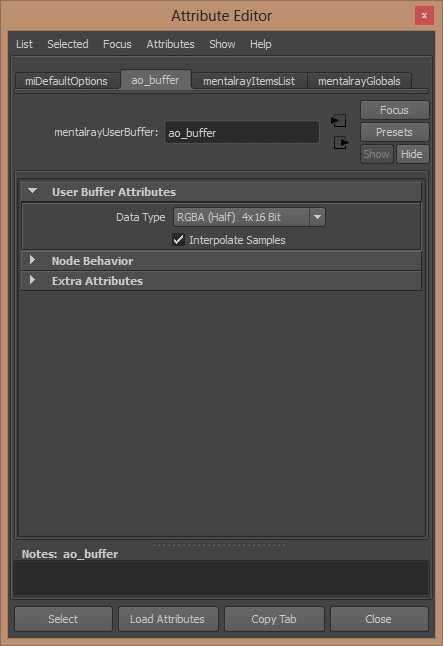 One of the new features in mental ray 3.11 is the ability to render Ambient Occlusion (AO) on the GPU while your CPU renders the other framebuffers. Shown some time ago at Siggraph in 2011, mental ray makes use of the CUDA and Optix technologies from nVidia. 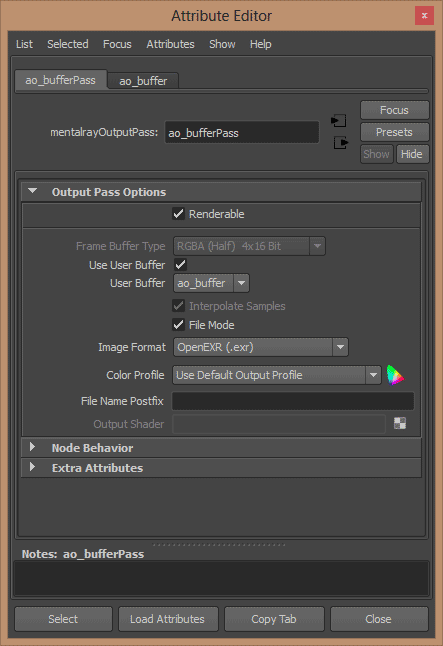 Using Standalone you also have the option to generate only the AO pass and skip other framebuffers. This is useful if you have a few machines with really nice graphics cards that allow you to render those frames quickly and send your other frames to the renderfarm that might not have adequate GPUs. We don’t typically render AO passes for everything like was done years ago for many reasons. It’s a multiplicative pass in compositing which can cause issues and higher quality indirect lighting like Final Gather or the Environment Light will create this effect naturally by default. However, there are many times there is an artistic look or requirement to use AO. How do I set this up in 2014? Maya 2014 ships with the required Optix Libraries to use GPU AO. Keep in mind you should be using an nVidia graphics processor (mental ray is, after all, an nVidia product.) I have a caveat here: I don’t have examples from my machine because I have an ancient Quadro that is not supported. And yes, I’m aware of the irony that I don’t have a new nVidia card. But this should work fine for most users using a modern Quadro or GTX card with the latest drivers. If you do NOT have the latest drivers, it’s likely you will crash. Current Quadro drivers are 320 as of this writing. Usually mental ray searches this folder for the libraries. However I have not found that to be successful so there is another way that is more consistent for me. Now you need the correct string options to generate and trigger the GPU AO pass. Added a plugin for fast computation of ambient occlusion pass if NVIDIA GPU is present. If enabled, ambient occlusion pass is computed on the GPU while the main and other framebuffers rendered on the CPU simultaneously. As CPU is not involved significantly into AO pass rendering, the AO pass is rendered almost for free. GPU AO rendering can be enabled with the string option "ambient occlusion gpu" on, or with the command line options "-ao gpu". If enabled, the framebuffer name used to store AO data has to be specified with the "ambient occlusion framebuffer"<string> string option. The "ambient occlusion max distance" <float> string option and –ao_max_distance <f> command line options can be used to specify the maximal length of rays used to compute AO. A negative value describes a factor relative to the scene extent. The default value is -1. The "ambient occlusion falloff" <float> string option and -ao_falloff <float> command line options can be used to specify the exponent of AO fading to the max distance. Default value is 1 (linear falloff). The "ambient occlusion falloff min distance" <float> string option and -ao_falloff_min_distance <float> command line options can be used to specify the distance after which the falloff takes place. The default value is 0. The "ambient occlusion gpu passes" <int> sting option and -ao_gpu_passes <int> command line option specify the number of times the accumulating AO framebuffer is rendered before averaging. It this option is not set, it is derived from mental ray max samples (per pixel) rate. The "ambient occlusion rays" <int> string option and -ao_rays <int> specify the number of rays per gpu pass. The default is computed based on mental ray max samples (per pixel) rate. The actual value used is rounded down to a Fibonacci number (1,2,3,5,8,13,…). The total number of ambient occlusion rays used per pixel is approximately the product of "ambient occlusion gpu passes" times "ambient occlusion rays". GPU AO respects visible, shadow and transparency flags in order to produce intuitive AO results. If GPU is not present, a fallback functionality is provided. The AO framebuffer is rendered according to mental ray’s raster sampling pattern and is not pixel identical with the GPU one. Now what’s left is to add the framebuffer you just specified with “ambient occlusion framebuffer” to the user framebuffers. You can do this in a similar way to using framebuffers with the MILA shaders. Create the Framebuffer for writing the output. LIB 0.12 13 MB info : loaded library "C:/Users/UserName/Documents/maya/2014-x64/mentalray\gpu_ao_plugin.dll". LIB 0.12 13 MB info : library "C:/Users/UserName/Documents/maya/2014-x64/mentalray\gpu_ao_plugin.dll": loaded mr_gpu plugin "mr_gpu_ao"
GPU 0.3 13 MB info : gpuao: time to initialize on gpu: 0.47 seconds. GPU 0.3 13 MB info : gpuao thread: Restricting to one CUDA device for Lbvh. Then the GPU will output progress while the beauty frame renders. . .in simple scenes it might output after the beauty render ends. You can then check the images/tmp folder of your project directory for the resulting image. You might also notice visual stuttering of your computer while it processes the frame. Your GPU resources are being used to render the Ambient Occlusion and therefore your Youtube experience will suffer while rendering.